Home > Fun > What Are Escape Rooms & Did We Escape? What Are Escape Rooms & Did We Escape? 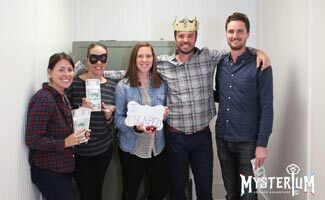 The Exploring Life’s Mysteries team has done multiple escape rooms. We quickly learned that these were not only addicting but a great way for us to bond as a team. 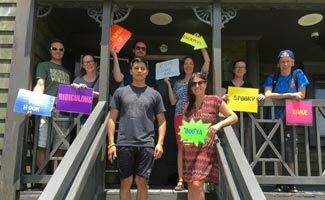 In addition to team building, escape rooms also offer a great experiential activity for family fun, a friend hangout or even a first date! An escape room is a live adventure game in which a group of players are locked into a themed room and have to find a way to escape. There is typically a 60 minute time limit to these physical escape rooms. If the group does not complete the room within the allotted time, they have lost. 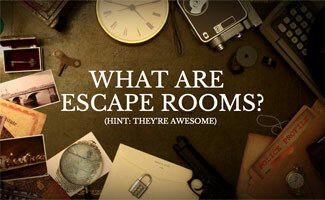 They are the real version of the video games “escape the room“. Each real escape room can vary but here is the overall concept of a real life escape room. Depending on the location there is a minimum and maximum number of players allowed in each room. We had 5 people in our group. The size of your group and the time you visit may dictate whether you will be alone with your group in the room or working with another group to solve the puzzles during the allotted time. You will not be allowed out unless there is an emergency so be sure to use the restroom before you start. The escape room workers tell you any “need to know” information ahead of time. For example, we were told there was nothing hidden under the floor boards so don’t try tearing up the nice wooden floors. We were then placed in the room and given 60 minutes to escape. We had the option to ask for clues if we were stuck on a puzzle. Some places deduct time at the end to penalize you for getting clues while others do not – be sure you clarify this before you start. You still get the full 60 minutes since that’s what you paid for, but if you asked for two clues then you would have two minutes added onto your final time. So if you finished in 50 minutes you really finished in 52 minutes after the clue penalty times are added on. The key to success in a real life escape game is to solve as many puzzles as you can while working towards solving the complete mystery or objective. The puzzles can consist of searching and finding hidden object, solving riddles, discovering keys and other riddles. This is what makes the game so much fun. We found as a team that we were each good at various tasks. Some of us were good at tearing rooms apart and finding objects that were hidden while others were better at solving riddles. That’s what makes these great team building escape room challenges. The concept of real life escape rooms originated from an adventure computer game in the 1980s. Players were supposed to escape imprisonment by using their surroundings. About a decade ago, Japan began building real escape rooms and today they have spread worldwide and appeal to a variety of people. If you are an avid escape room participant, consider the Escape Game Card, as it provides discounts at more than 290 escape games worldwide! The first escape rooms we ever participated in was at Trapped in Cleveland. 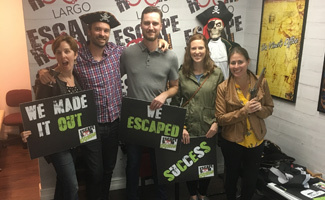 We did all four of their escape rooms in one afternoon— it was a lot to handle. After the first two rooms, we took a break and came back for the third and fourth rooms. We found that after the first two rooms we were pumped and excited for the next but after doing the third room, our brains were mush and even more after the fourth. Our fatigue had nothing to do with the quality of the rooms. We were worn out simply because doing four rooms at a time (4 hours of intense brainwork!) is a lot to do. So we would not recommend doing more than two rooms at a time. Here are our personal reviews, listed in the reverse order of when we played them, starting with the most recent. We visited Escape Room Extreme in Largo, Florida, to do one of its three rooms: da Vinci’s Office. Upon arriving, we weren’t asked to sign waivers (a requirement at most escape rooms), so we got straight into the game. The Quiz Master gave us the rundown and let us know that all the clues would be linear (meaning that when you solve one clue, it leads to the next). We all agreed this was a huge benefit to our team building efforts because it required us to work together to solve each clue. There was no penalty when you ask for help, but the Game Master only assists to the degree they think you need it. We didn’t realize until asking a second time that the small monitor in the room gives clues (vs. voice, to which we are accustomed). So we may have missed the first one. There was also a bonus puzzle that was unrelated to escaping. If solved, you received a free t-shirt (something others could work on when not busy helping with the main game). We were on a roll and managed to finish the primary da Vinci’s Office game with 15 minutes to spare, so we spent our extra time (unsuccessfully) attempting the bonus reward. There’s no leaderboard at Escape Room Extreme, so no pressure other than to have fun (which we did). The da Vinci room specifically was the perfect balance of types of locks and clues and great for intermediate escape gamers. Perplexity Games is rated one of the top things to do in Cleveland by TripAdvisor, and we can see why. Located in the basement of an old warehouse in the Ohio City neighborhood, Perplexity Games has been around since 2016. When we visited in July 2018, Perplexity had three rooms to choose from. We went with the Eliot Ness Escape room, based on a local legend. Unlike most escape rooms where the theme becomes lost in the chaos of clue solving, in the Eliot Ness room it only enhanced the experience. Many of the clues were themed around Cleveland’s history and had some sort of educational component. We really appreciated this special touch. Atypical of other rooms we’ve experienced, you cannot ask for help or clues in this game. Rather the game master plays a character in the story to subtly guide you along if they sense you are struggling. The game used lots of sensory experiences (e.g. music, lights, etc.) to keep things interesting. The Eliot Ness room will definitely test your team’s communication skills and will keep each member busy with different tasks that can be worked on independently to get to the common goals. We experienced no hitches with the game (other than getting caught up for a while on two puzzles). We won’t spoil the room, but let’s just say we were seconds away from solving it and had an adrenaline-filled ending. All in all, it was entertaining and we all agreed that this was among our favorite rooms to date, despite the fact that we didn’t escape (which to be fair, we were down one teammate fro our usual 5 people crew). 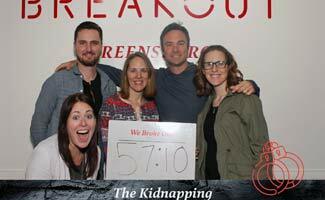 With locations throughout the Midwest and East Coast, Breakout Games is a franchise escape room that has all the benefits of a “chain” (standardized games, technology, etc.) without feeling too corporate. We were impressed with the online waiver that we were able to complete prior to arrival, saving us time during check-in. While a bit skeptical of being handcuffed and blindfolded, we opted for the Kidnapping room. 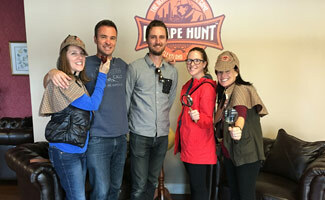 The pace of the clues and the room’s difficulty was challenging, yet fun. 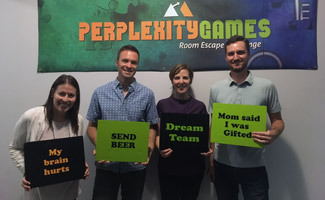 Having done several escape rooms, we found ourselves overthinking several clues that were obvious. One perk of this particular escape room is there were no penalties for asking for (unlimited) clues. The only catch is everyone has to agree to ask for the hint. The Game Master was hilarious and would chime in sometimes (don’t look there or don’t use that) to keep us out of trouble. We escaped with 2 minutes and 50 seconds to spare! Personally, this room was one of my favorites. There were no flaws in the clues, the space was clean, and the gameplay was top-notch. Dare2Escape is located just outside Orlando, near the Walt Disney theme parks. They have three rooms, but we opted for The Dig, designed for 4-5 players (versus the other two which are 6-8 players). We were greeted by an enthusiastic clue master. He explained the game and, once in the room, he went into (great) detail about the rules, how the different types of locks work and what to do with them once unlocked (although in the heat of the game, we forgot this important detail). From the moment we stepped into the room, we were transported to the archaeological dig site, complete with canopy tent and Sahara desert sand on the ground (although the room temperature was freezing). To help get into character, Dare2Escape even provided each of us with a headlamp (which came in handy throughout the game since it was a bit dark). Dare2Escape gives you up to three “free” clues without losing your chance of being on the leaderboard and there is no time penalty for asking for additional clues. These clues were hilarious and super personalized to our situation. We really appreciated our game master’s sense of humor as it helped to break the tension when we were getting frustrated. After gathering puzzle pieces and uncovering as much of the game as we could, we asked for assistance from time to time from the game master. The clues got us moving in the right direction and we escaped within seconds of the time running out! Escape Room Cleveland has two locations in the Cleveland area. We originally only signed up to do the Indiana Jones room at the North Olmstead location, but had so much fun escaping we opted to add on a second room (Hangover 2.0). The two rooms were very different and both very fun. Luckily we escaped Indiana Jones with three minutes to spare (using all five clues) and the Hangover room we escaped with a whopping 16 minutes to spare (only using three clues)! Unlike other escape rooms we have visited, this one had no penalty for using clues. But the clue master was not monitoring our room at all times. Also, there was no 2-way audio so the game master could not hear us when we were struggling so we had to signal them with our hands and try to be patient while we waited a few minutes for them to respond with a clue. Further, because they weren’t watching and couldn’t hear us, they didn’t know what we had already tried so some of the clues were not very useful based on our progress. Despite these minor hiccups, we still managed to escape from both rooms we tried and had a blast with these unique Hollywood-themed rooms. Overall, the rooms were very original. They even had theme music to keep you entertained and get you into the mood of the story. The Insomnia Escape Room DC in Washington DC is located on the 2nd floor of an old building off Wisconsin Avenue near Georgetown. We entered the lobby and signed the super fancy electronic waivers (on tablets) then got a quick rundown of the rules and overview of the room. Unlike some other escape rooms, this one did not have a video to get you into the mindset and mood of the game. However, they did have a virtual reality escape room which we were tempted to try. But after reading that The Alchemist room was a 2016 Golden Lock-In Winner and in the TOP-13 among 200 rooms across USA, Canada and Australia by Room Escape Artist, we had to try it! Without giving away too many clues or spoilers, we were in a library on a mission to find the Philosopher’s stone. There was great use of interesting technology and a good mix of clue types (locks, cyphers, puzzles, etc.) – enough to trick us up. In fact, we ended up asking for a few clues to help (you get up to 3 without jeopardizing your chance of being on the hall of fame but to find your name there you will also have to complete the room with 15 minutes or more remaining). We were glad we used the clues because we escaped with only 3 minutes to spare! While some rooms have a clock in the room that counts down the time remaining, this one did not, adding to the excitement since we did we were unaware of how much time we had other than periodic announcements. We had a great time and all agreed it was one of our favorite rooms yet. The Tampa Bay Escape Room is located in downtown Clearwater on Cleveland Street, in the heart of the business district. They offer 3 rooms to choose from: The Music Producer (for entry level players), Cabin in the Woods (for more advanced escape artists) and Kidnapped (advanced as well). With a few rooms under our belt, our team opted for the more advanced Kidnapped room. We agreed it was our most fun room yet! Perhaps it was our experience, but we were flying through the puzzles once we got into the groove. We also appreciated how our particular room had a large whiteboard for taking notes so we could all see the information we were gathering and use it to strategize our next moves. Almost all of the puzzles worked from start to finish so nothing really held us up other than our own brains (malfunctioning game parts have frustrated us with some other rooms in the past). The only thing we’d improve was the plot which seemed to be a little thin on content compared to other rooms we’ve tried. Luckily we escaped having used only 2 of the 3 available clues and with a mere 30 seconds left! 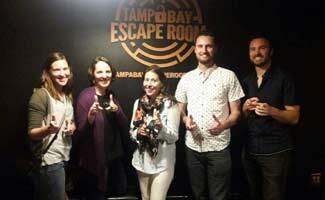 We would definitely recommend trying the Tampa Bay Escape Room next time you are in the Tampa Bay area (they switch out the rooms yearly to keep you coming back). 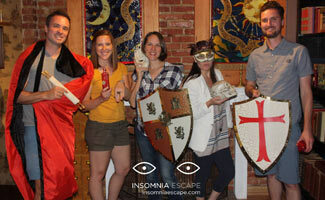 Located in the heart of downtown Boone, NC, is Mysterium Escape Adventure. They opened in late Summer 2016 and we had the chance to try them out in October of the same year. When we went to Mysterium, they only had one room completed called “The Inheritance” and it was by far the toughest room we’ve tried yet! We were surprised to see the record time was around 20 minutes too because one clue alone took us at least that much time! Even after multiple hints we struggled (we held out as long as possible to ask because if you ask for hints you are no longer in the running for the Wall of Fame)! However, they do not penalize your time for hint, but, honestly, that would’ve been better than taking us out of the running for the Wall of Fame (yes, we are a tad bit competitive 😉 ). 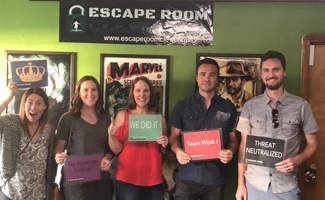 As the room’s name implies, the theme is to finish to solve the clues to “earn” the family inheritance (hence us holding money and jewels in the completed photo they snapped after we finished successfully). Check out Mysterium’s website for updates because the rumor is that they have a second room coming soon! Kersey Valley Escape ‘s Haunted Manor is more than just a room; it’s a mansion that takes you through a series of rooms that takes you through an entire haunted house! This is definitely the biggest escape room we’ve tried so far. Enter the house and you are immediately spooked with the decor and creepy music, plus you start in complete darkness. As an added distraction, there are interactive elements throughout the journey including loud explosive sounds and other surprises along the way (we won’t spoil the fun!). And the darkness paired with so many twists and turns make it even more challenging to solve the mystery (in addition to escaping the room). Kersey Valley also has other activities to keep your team or family busy including Old West and Autopsy themed games, zip line, high ropes course, a corn maize, and other seasonal events. Later that night, we were exhausted but longing for more brainiac fun. So, we found Escape Hunt and decided to book the room called Meltdown in the Steel Mill. This was a really fun experience for us as a team. The workers were even dressed up in costumes as they told us about the room. Everything about this place was professional except the spelling in the clues (read more below in the escape room review). Clues counted against our time at this location. There were areas we flew through and areas that stumped us. The setup was great and everything was organized. There was one specific puzzle that was quite puzzling which we asked for clues on probably five times. The clues weren’t always great at this location and there were spelling errors sometimes which made us think there was more to a clue than there really was. This room really tested our ability to work together and it was a great team bonding experience. We were so overjoyed when we opened the final door with 2 minutes to spare and were able to leave with a victory on our terms! 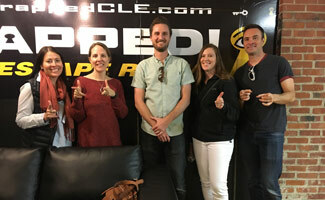 Overall we enjoyed our experience at Trapped. The only negatives were the cellphone reception was lacking for our helper (see the Chainsaw section) and some faulty equipment (see Apocalypse). Trapped had a variety of cool rooms: Apocalypse, Pirate Tavern, Chainsaw and The Cell. Clues were not counted against our final time at this location. The first escape room any of us ever did was Apocalypse. We were all a bit confused when they shut the door on us but we eventually found our groove. There was a briefcase in this room that was broken (it should not have been – that was not part of the game). This was frustrating because it caused us to ask for another clue that we did not really need. The worker ended up coming in the room to open the case for us. In other areas of the room we divided and conquered for puzzles and at some points we all joined forces to complete tasks. It was a great team bonding experience. Unfortunately, we didn’t finish this puzzle but we were close! Pirate Tavern was our second room and boy was there a lot to do! This room was filled with tons of little puzzles which meant most of us were doing our own thing so we had time to get everything done. At the end we had about two minutes left and I was playing around with some objects and discovered that it was the final puzzle and somehow got the door to pop open. It was complete luck that we completed this room! This had a really cool concept, we were all blindfolded and handcuffed at the beginning of this room and it was pitch dark which added another element of surprise. The final puzzle was pretty tricky so we asked for a clue. Trapped employees use their phones to access the puzzle answers and at the time we asked for a clue the worker’s phone didn’t have reception. As she tried to find the answer on her non-functioning phone, we lost precious time on the ticking clock. It was a bit frustrating and this happened a couple of times. So we never truly found out how to solve the final puzzle in this escape room but the worker completed it for us. So we kind of won this room. This was the best escape room at Trapped in my opinion. Maybe it was because it was our last room so we were pros or maybe it was because I liked the setup. This one had fewer major clues so we all got to work together throughout the entire room — I liked that aspect of it. Plus it was setup like a jail cell which was pretty cool. It actually took place in three different rooms too so you had to solve clues in room A to get through the room B and then to room C. This made it feel like more of a real prison escape situation which was fun to put ourselves in the prisoner’s shoes. We were able to complete this room on our own. We won! Although watching Team CoCo’s experience in an escape room is funny, we suggest you take it more seriously so your chances of escaping within the time frame are more likely. Have you done an escape room before? Tell us about your experience! Did you do it for work, a family outing or a first date? Were you able to escape the room in the allotted time? We’d love to hear all about your experience! Which escape room should we visit next? 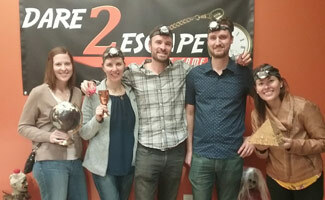 I just recently discovered Escape Rooms in DC after hearing about them from friends who raved about it so my co-workers and I did one and it didn’t disappoint! And it was Oval Office themed which was a fun since we work in politics. Wish we could have taken pics inside but they don’t allow cameras (to spoil the fun and/or cheat on questions/answers).